Prominent & Leading Manufacturer from Chennai, we offer rubber bushes and sbr rubber profiles. 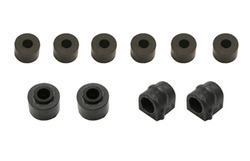 We manufacture a wide array of Rubber Bushes that are manufactured using modern technology and equipment. These are available in various sizes and can be customized as per the needs of the clients. Further, Rubber Bushes are known for offering good resistance and high flexibility. These bushes are used in different machines in order to take up torsional movement as well as radial & axial load and conical deflection. Our engineers manufactured these bushes with ultra-grade rubber incorporating sophisticated technology. 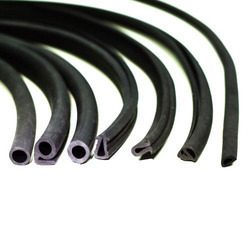 SBR Rubber Profiles offered by us are manufactured using high quality raw material. These are used in various industries for the purpose of sealing of large vessels and machines. In addition to it, Rubber Profiles manufactured by us offer a very good compression for durability. Sri Sai Rubber Products Private Limited is established in the year 1997, as a leading manufacturer, exporter and supplier of a wide range of of Rubber Products such as Extruded Rubber Profiles, EPDM Architectural Gaskets, Rubber Rollers & Many more. Our organization is an ISO 9001:2000 certified company. Looking for Rubber Bushes ?